Engineered to 3D print parts that can hold up under stress. MakerBot Tough is designed to be the go to 3D printing material for projects that require the strength and durability that standard PLA may not offer. It is engineered to have a higher impact strength, and a tensile and flexural strength that matches ABS. 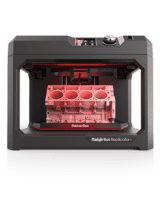 Now designers, engineers, product developers and manufacturers can 3D print parts on their MakerBot Desktop 3D printers that can be used for functional testing and manufacturing aid applications. Print with confidence, print tough. With double the impact-strength of ABS and similar tensile and flexural strength properties, MakerBot’s Tough filament gives users the durability for a wide variety of industrial applications that hold up under all types of stress. Print your parts reliably without having to worry about flaws in ABS such as warping and curling with MakerBot Tough filament. There’s no longer any tweaking or excessive adjustments involved in your printing process. Regardless of your design challenge, MakerBo Tough filament makes it simple to test and display your parts in real-world situations. Just easily put your printed part into the CNC or drill press, tap some threads, and bolt on a steel bracket. Sanding the surface and painting for a finished showcase piece is also an option with MakerBot’s Tough filament. There are four MakerBot Tough filament colours for creators who require colour coding their parts, or desire more creative flexibility in presentations. Local Motors, a new concept automotive company, designs and builds vehicles using 3D printing. They are daring to uproot and redefine the entire automotive manufacturing industry through creating a more localized approach to production. Their micro-factories design and manufacture cars right in the region they serve, a perfect fit for the supply chain advantages 3D printing brings to the table. Read their story, about how MakerBot desktop 3D printers gave them an opportunity to execute on their big ideas. Net Weight 0.9 kg (2lb) MakerBot Tough Filament is required to be stored in a cool, dry place as it can absorb moisture from air and long-term exposure to humidity, which can also compromise filament quality and performance.